Endeavour was moored alongside to allow luggage and supplies to be loaded. It's amazing how much stuff three men can carry for a few days away. There's the wet gear, (we all know how rough some trips have been), clothes and food. Finlay had forgotten the milk. The skipper’s jacket fell in the creek instead of on the deck but the sunset was lovely, there was no wind and we got away sharply. The voyage down the Thames was a delight and as the darkness deepened the lights on buoys shone clearly making navigation easy. Paul and Allan shared helming duties while Finlay retired at midnight to try to sleep. He didn't, not for hours. Allan snored for England snatching Marshall's ‘Loudest Snorer’ title easily. When awakened the French coast lay ahead and Ostende was on the horizon. 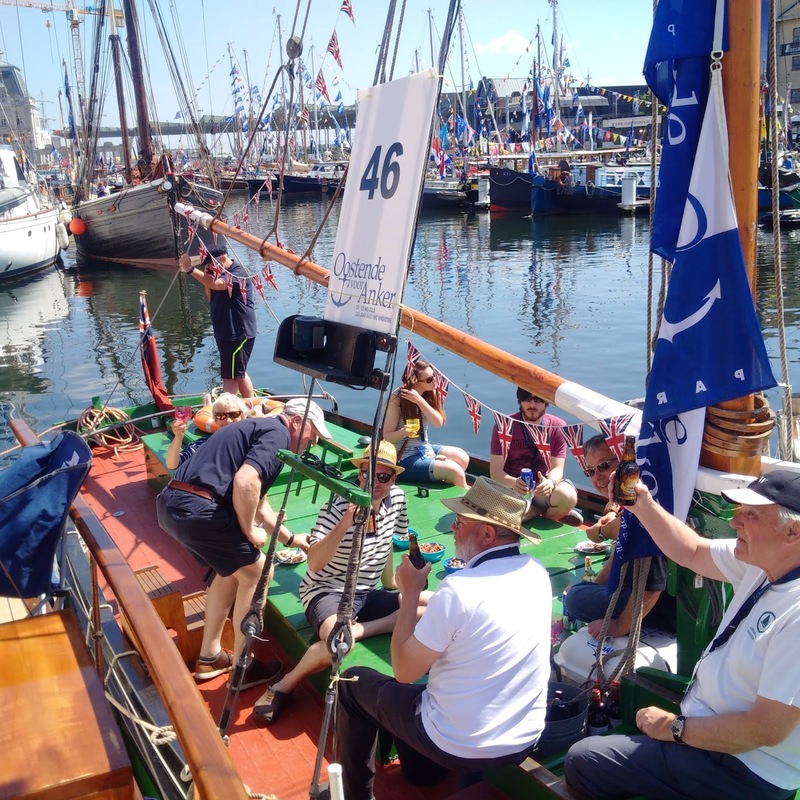 We docked just after lunchtime to find the quaysides busy as stall-holders set up for the Festival. 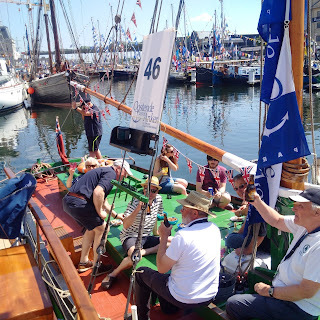 Inside the harbour we were directed to moor alongside other Dunkirk boats, Lady Lou, Caronia, White Marlin and Lazy Days. The ADLS crews attended the centenary ceremony for HMS Vindictive, the warship which was sunk as a block ship at Ostende in May 1918 after being badly damaged in an earlier raid. Representatives from the Royal Navy, Belgian Navy and members of the diplomatic corps laid wreaths before the bows of the ship which survive as a memorial near the harbour entrance. Our trip back to town was aboard a 1927 Hastings trolleybus! Now fitted with an engine it ferried passengers around town. Well it did once they gave it a push start! Later that day we were visited by our Ambassador to the EU, Alison Rose and the chief of the Belgian Navy Admiral, Wim Robberecht. Aboard Endeavour there is a strict rule; no alcohol and it is strictly enforced for the safety of those aboard at sea. Over the years we have been invited aboard some of the motor yachts to enjoy a glass of wine and some food. Firmly moored next to Lazy Days in the harbour we decided it was party time. So, with beer and wine from the supermarket and smoked fish and shrimps from the local market we invited ADLS crews aboard including ex-commodore Ian Gilbert and his wife Carina. We had no idea than that it was Carina's birthday. 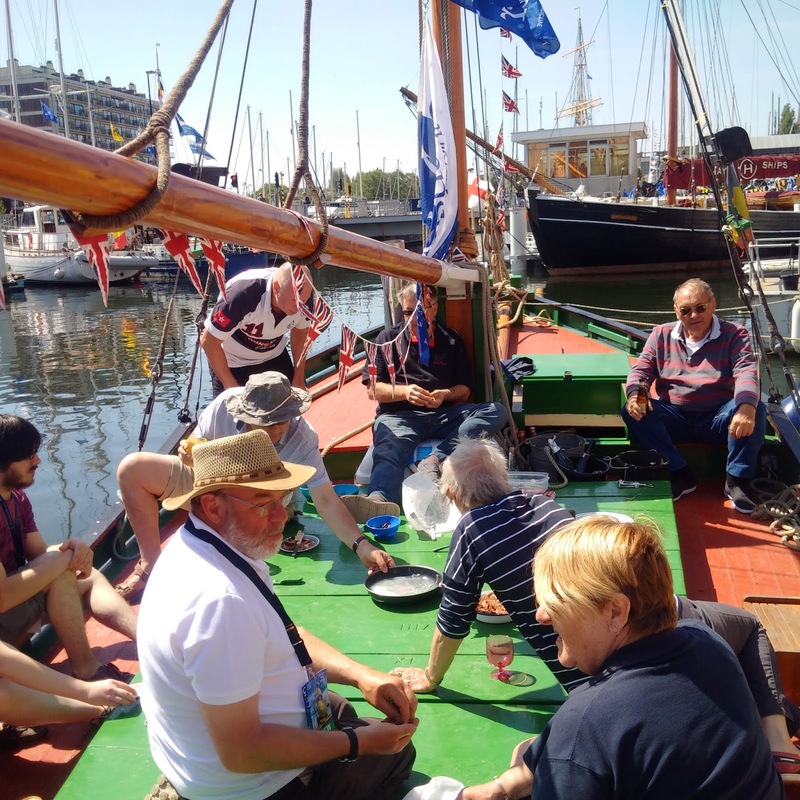 The truth is we didn't know but the crews sat in in the sun for lunch, from time to time joined by crews from other boats ready to yarn over good food and a few beers. Friday dawned with poor weather forecast over the weekend. The ADLS crews decided to make a run for home while conditions were good which meant leaving a day early. Finlay was in charge of the hotel bookings and responsible for checking out. On the quayside the sun was shining, and crowds were pouring along the pontoons. By the time Finlay left the hotel he discovered Endeavour gone! The queue for the pontoon included several boat crews with supermarket trolleys jamming the way. Endeavour was into the first lock by this time. Fortunately, Lady Lou had not quite cast off and Finlay and his luggage were taken aboard. Once in the lock he transferred to Endeavour and the flotilla left Ostende for home. Many spectators watching us said: “Thank you for coming. Please come back next year,” which is good to hear. Having departed in sunshine we had a good run to the Thames, but clouds were gathering. As we passed the wind farms rain started and our final approach to Leigh was in torrential rain. Shortly before midnight Steve Meddle took our lines and we moored.